Croatia winger Ivan Perisic has scored a well-taken equaliser in tonight’s World Cup semi-final against England. 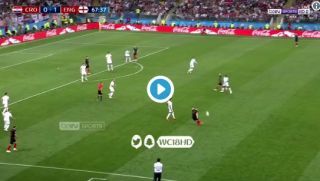 Breaking superbly into the box, Perisic got the deftest of touches on the ball to guide it into the back of the net and make it 1-1 in this intriguing contest. A World Cup final spot against France is up for grabs for whoever wins tonight, and it’s now anyone’s guess who that will be as Croatia respond well to England’s early dominance.